What might Abbott and Costello have accomplished had they used their boxoffice power toward more creative ends? Top ten status on exhibitor polls suggests freedom to experiment and vary the formula, but Bud and Lou cared more about good life stardom conferred than enhancing their output. Rather than develop material, they played cards. Every distraction was catered to. 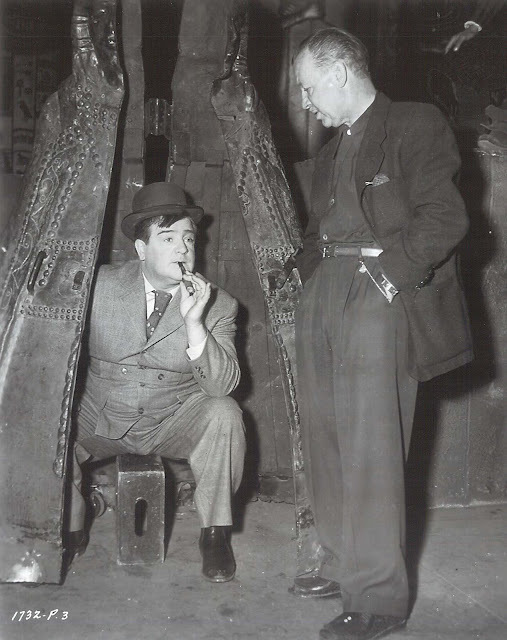 Ad-libbing tolerated on an Abbott and Costello set would likely have been verboten for Laurel and Hardy at Fox or The Marx Brothers at Metro, yet imagine what these comedy teams could have achieved had they enjoyed latitude Bud/Lou were given. A&C’s single gesture toward creative control seems to have been insistence upon two offbeat features in which they were more/less split up, Little Giant and The Time Of Their Lives, but was that really an effort toward better picture-making, or just a means of getting a vacation from one another? Lou’s antipathy as regards Abbott and Costello Meet Frankenstein makes you wonder what he might have preferred in its place. What works in A&C comedy is probably the result of lack of preparedness, and the audience’s sense that much of their stuff is random. According to co-workers, this was a near right assumption. My sense of Abbott and Costello is that they preferred a stage to motion pictures. With early television, the pair very nearly got back what they’d missed since burlesque days in the thirties. Movie slapstick was a commonplace wherein any number of comics surpassed A&C’s experience and expertise, but with regards verbal patter, these two had no peer. Who’s On First is still a miracle of timing and delivery. Skits on The Colgate Comedy Hour were but flimsy preambles to well-honed routines excavated from theatrical trunks, much of it new to home audiences that had ignored their features over the last six or seven years. Were adults still going to see Abbott and Costello in the early fifties? Absence of singers/bands suggest capitulation to simple demand of juve matinees; it seemed the boys were falling down more and talking less. By the time things got round to Abbott and Costello Meet Dr. Jekyll and Mr. Hyde, Lou couldn’t even approach a door without falling through it. 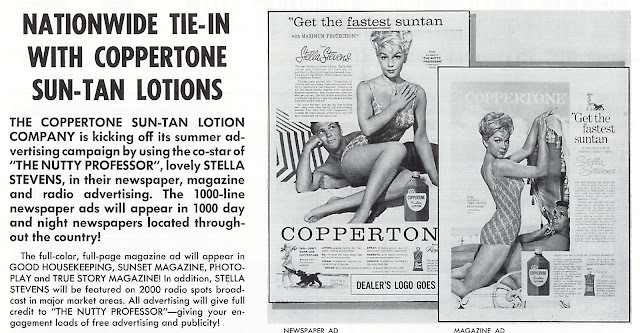 I don’t wonder that the team preferred TV work (their own series as well as the Colgates --- both running strong by 1953). Universal contract starlets shunned the A&C unit for perceived kiddie ghetto standing, but worse still was over-saturation of the team a result of ancillary marketing after the war that would impact on viewing habits among both viewers at home and audiences in non-theatrical environments. Realart’s heavy schedule of Abbott and Costello re-issues were in direct competition with the team’s new releases in the early fifties (much as would be the case with Jerry Lewis in the sixties), so much so that Universal was obliged to emphasize All New legends they now attached to posters (including the one shown here for A&C Meet J&H). Realart had leased much of Universal’s backlog for a ten-year period beginning in 1946, and exhibitors were happy to pay their minimal rentals as opposed to higher terms imposed by U-I. United World was a subsidiary of Universal that sold 8 and 16mm movies to home viewers under the name Castle Films. Abbott and Costello were ideally suited to fill these eight-minute souvenir reels, their routines being compatible to shorter lengths and overall plot being of no real consequence. Once you bought a Castle Film, you could do what you liked with it. Ownership was outright. Boomer kids encountered Abbott and Costello at birthday parties, public libraries, church bazaars … wherever someone could plug in a tabletop projector and go to work. Here was a stream of revenue A&C would not drink from, at least initially. A lawsuit filed in 1952 settled in their favor, but by the mid-fifties, a combination of Realart and Castle, plus increasingly tired output, made Abbott and Costello seem played-out. Rurals and grindhouses continued using them. 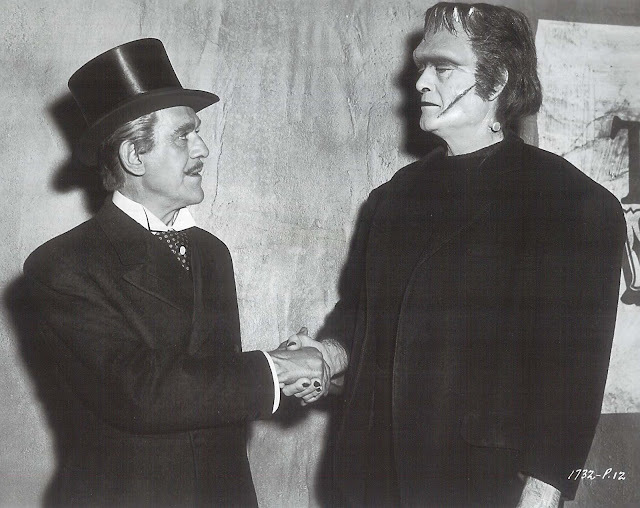 Abbott and Costello Meet Dr. Jekyll and Mr. Hyde (Lou shown here with director Charles Lamont) found new glory at a small Vernon, Florida theatre in September, 1958 --- My best grosser in Vernon was not "3:10 To Yuma" nor "Operation Madball"… It was this reissue of an old Abbott and Costello. They laughed long and loud. They whooped and hollered and rolled in the aisles. Well, why would manager I. Roche lie? --- though it’s hard to imagine anyone rolling in the aisles over Bud and Lou’s dispirited antics this time out. Maybe that crowd had something to do with it, as we know from experience how contagious audience laughter can be. Universal was at least considerate enough to withhold their features from television for at least a year or two beyond the dumping date chosen by other studios, for it was 1958 before Screen Gems (U-I’s lessee for most of its pre-48 library) began penetrating markets with A&C oldies. Later comedies with the team (including Abbott and Costello Meet Dr. Jekyll and Mr. Hyde) made it to television via packages from Seven Arts (starting in July 1963), but were split up among mainstream Universal titles. Consequently, your local channel might run Lost In Alaska five times, but Abbott and Costello Meet Frankenstein not at all. It was July 1971 before MCA packaged all their Abbott and Costellos into a dedicated group of 29 features, the leases with Screen Gems and Seven Arts having run out. By this time, most exposure for the group would come via independent UHF stations. 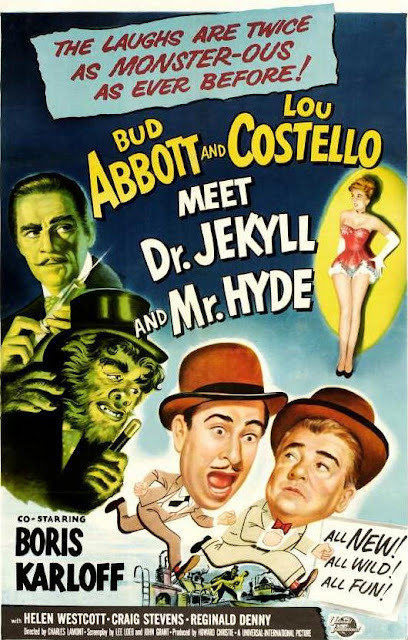 Abbott and Costello merely used Jekyll and Hyde as a hook to further their Meet The Monsters series. 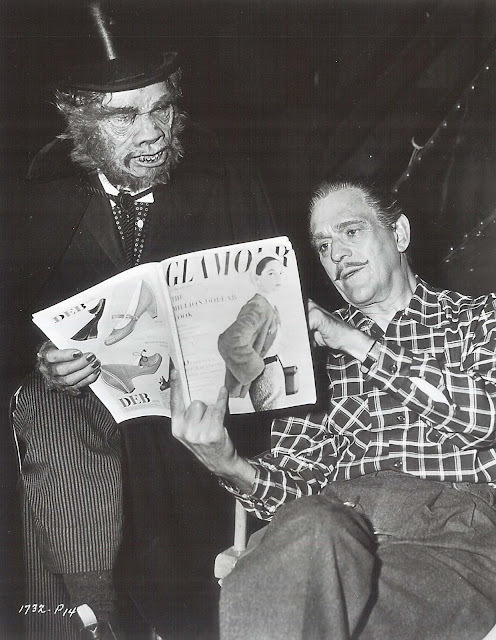 Boris Karloff reprised his mad science template of yore. 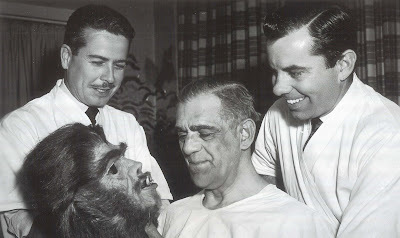 A Westmore fright mask was donned for publicity, but I wonder if Karloff ever stood before a camera in the Hyde guise. Why impose upon an actor in his sixties when any number of stunt artists could slip the rubber over their face and bound over backlot rooftops? (in fact, one of them broke an ankle doing so) The only authentic spoof on Jekyll and Hyde would come from Jerry Lewis, and his would emerge a cleverest of take-offs. 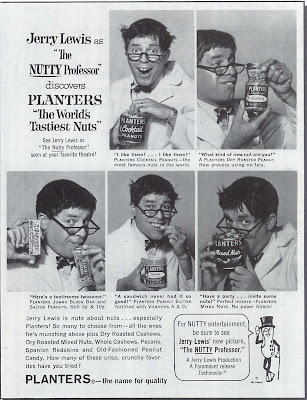 The Nutty Professor is so good you can’t believe JL made it. Every writer has one great story in him/her, and the Professor is Jerry’s. Everything right about his staging, direction, and design is here. 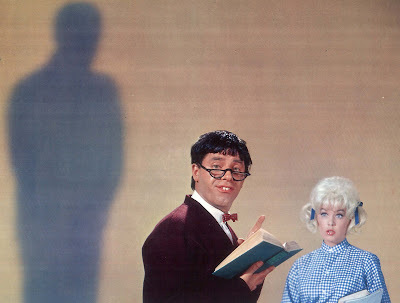 I was stunned by use of Technicolor alone when The Nutty Professor unspooled at the Liberty for a 1966 reissue, a late date for catching up, though neighbor kids had told me how fine this one was. Paramount actually bought the back cover of Famous Monster’s 1964 yearbook for promotion, which I’ve shown here primarily because it’s the only time I've seen this ad style used anywhere (and, correct me if I’m wrong, a sole occasion where a major studio bought space in FM). With references to previous J/H enactors (Barrymore, March, Tracy), you’d almost think Paramount customized the page especially for FM readers, which I’m inclined to believe, as I couldn’t locate any mats in the pressbook resembling it. Query --- who’s Buddy Love supposed to be? Another subject flogged to death elsewhere, but I’ll venture he’s a composite of Rat Pack ethos Jerry was said to have deplored (at least then). Though Buddy ended up resembling Jerry himself, I wouldn’t think the man could have harnessed self-awareness to lay bare such a corrosive off-screen persona before an unknowing audience (bearing in mind that 1963 devotees didn’t necessarily know Jerry as we do now). As to speculation Hyde/Love mirrors Lewis’ former partner, he actually seems more Frank than Dean, but just who in Jerry’s show-biz orbit behaved so cruelly as this? Were there multiple Buddy Loves running loose backstage in Vegas or between shots on movie sets? Reading post-mortem bios surfacing over the last decade or so, I’d venture to say yes. Lewis brought them too close for his audience’s comfort. I know fans that grew up with Jerry who draw the line on The Nutty Professor, for Buddy Love’s nastiness has way too much ring of truth about it. All the more credit to him for refusing to soften that alter-ego, for it would have been easy to hone off the edge and still realize the rentals ($3.3 million, his best but for The Bellboy). They filmed at Arizona State University. Big band Les Brown, once renowned, entertains for a 1963 class of undergrads during a prom night that all but stages a jitterbug rally in its backward retreat toward 40’s sounds Jerry loved. He was down on a pop culture fast going to hell, and said so to reporters who’d listen. No kid of his would go to the theatre and "watch lesbians" (was he thinking of Walk On The Wild Side or The Children’s Hour, both in recent release at the time?). Permissive movies were imprisoning families in front of their televisions --- is this what Hollywood wanted? Buddy Love wows ‘em at the Purple Pit when he gives out with That Old Black Magic, a standard with a beard a mile long, but look at the "students" he’s crooning to --- most thirty at the least --- I even glimpsed Dave Willock, Jimmy Ellison’s old army sidekick from 1943’s The Gang’s All Here. Hindsight might prefer Les Brown to the spectre of a Duane Eddy backing Jerry, but little of this serves the cause of verisimilitude. Music is a happiest element of The Nutty Professor. Re-using Victor Young’s beautiful Stella By Starlight as a principal motif was inspiration itself. Lush scoring was on its way out by 1963. More power to Lewis for keeping the sound alive long after others had abandoned it (and I’m reminded as well of David Raksin’s fine work on The Patsy). I can’t speak for others, but the rapturous series of dissolves with Stella Stevens at Kelp’s classroom door is one of the most perfect weddings of music and visuals I can recall. Lewis lived a credo of grassroots exhibition. Both would fade around a same time. 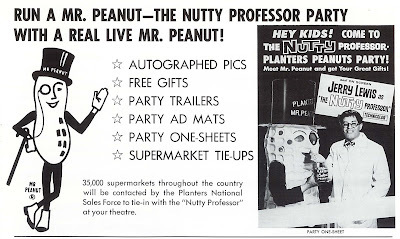 Jerry went out with The Nutty Professor on a grueling 25-city tour jammed into a 44-day schedule, doing a live show (with the band he brought along) at every stop. No one stumped for product like Lewis. Nearing forty when he split with Paramount (amidst lawsuits and recriminations), the once indestructible wickets champ faced an industry stripped of Code protections he had relied on, and a family audience he had depended upon. Jerry’s attempt to beat back the tide with a string of "G" rated movie theatres bearing his name was dismissed as reactionary. He would spend decades cussing the dirty movies he says put him out of business. John, I couldn't agree more regarding the title arrangement of "Stella" in NUTTY PROFESSOR. It's the best I've ever heard, giving me chills every time I hear it. From all I've read PROFESSOR had been brewing in JL's mind ever since the Dean days and if you'll pay close attention to the scene where he's being interviewed on television in '55's ARTISTS AND MODELS, you'll hear the Kelp voice trying to creep in. Thanks for bringing up his musical contribution to the movies, something too frequently overlooked. WPIX in New York showed A&C features every Sunday morning for years, (the same station showed their TV show on weekdays. )and as a kid/high-schooler I found them exceedingly re-watchable--with little patience for the musical numbers. Of course, always waiting for A&C Meet Frankenstein to show up in the rotation again--today, I'd rather another one show up on TCM once in a while. I've been very tempted to get the DVD of their TV outing with the Creature from the Black Lagoon. As with Elvis, I don't think I've ever gotten through one of Jerry's movies start to finish. When I see one on TV, I'm more fascinated with stable of featured players that were so ubiquitous in 60s TV and movies. I saw USED CARS in one of the last remaining Jerry Lewis Cinemas probably less than a month before it closed up. 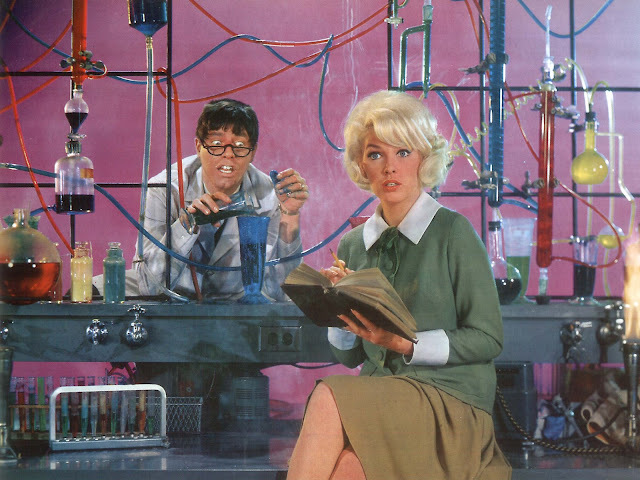 I saw "Nutty Professor" at the Museum of the Moving Image in Queens -- the first and last serious Jerry Lewis retrospective in the U.S. Jerry provided his own print, and man was that Technicolor explosive! It reminded me that the three-color process was so much more vibrant -- I thought, oh yeah, this is how color movies looked when I was a kid. Jerry also provided his make-up tests as Kelp plus a bunch of outtakes. The funniest was when Kelp's at the bowling alley and mistakes a child's head for a bowling ball. You have to see it to appreciate it. And for who Buddy Love really is, just rewind any interview Jerry's done in the last 40 years -- the two are inseparable. But damn, the guy deserves a special Oscar for all his work. 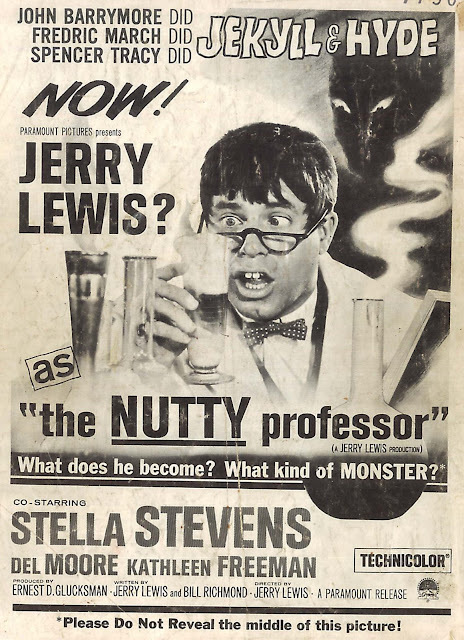 I've always felt that The Patsy was right up there with Nutty Professor (but then, I recommend watching *all* of Lewis' movies from start to finish). Too bad the DVD is so horribly cropped. 1) By the time MEET DR. JEKYLL AND MR. HYDE came out, there was still a large adult audience for A&C. In fact, during the sneak preview (which were done with mostly adult audiences), the results were one of the best preview reactions Universal had had for an A&C film since MEET FRANKENSTEIN. 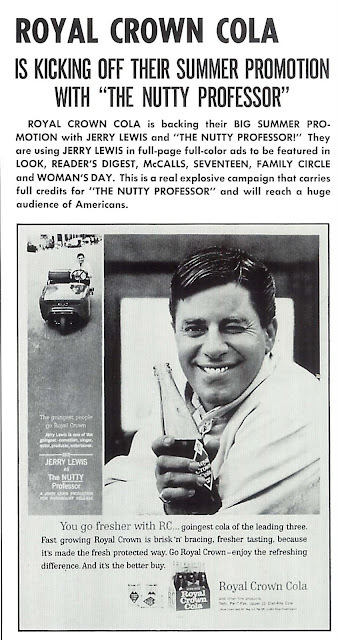 2) While I'd never debate that THE NUTTY PROFESSOR is a great film, it is only PART of Jerry Lewis's pinnacle, surrounded by the incredibly funny THE BELLBOY, THE ERRAND BOY, THE LADIES' MAN and DISORDERLY ORDERLY. The other Paramounts are fun, too, but those are his apex as a film maker, for sure. What Jerry was basing Buddy Love on is only in Jerry's head-- but truly unimportant. So many have hypothesized that Jerry was lampooning at the Rat Pack scene (particularly Dean) at the time, but considering how many people in that group were his close friends, and the respect he had for Dean (even at that point), I find that doubtful.